ANAHEIM, Calif. (AP) -The Anaheim Ducks' defense, a key to their Stanley Cup championship last season, looked sharper with Scott Niedermayer back on the ice. The San Jose Sharks still came away winners Sunday night, with Joe Thornton's shootout goal the difference in a 2-1 victory. "There are always really good games against Anaheim," Thornton said. "Every game we come here or they come up to us, it's always an exciting, low-scoring game. We've been having a lot of shootouts against them, so it's nice to win this one." After only four of the 11 previous shooters in the shootout were successful, Thornton ended it with a snap shot to beat Jean-Sebastien Giguere on the stick side. The Sharks had lost two previous meetings with Anaheim this season, with the Ducks winning both on shootouts. The Ducks did manage to hold San Jose to just the lone goal through regulation and overtime, a marked improvement to the five they allowed in a 5-2 loss to Minnesota two days earlier. Niedermayer played 23:52 against the Sharks, took one shot and drew a penalty for holding. "Getting that first one under your belt is always a big step," he said. "The next two games are back-to-back, so that will be another bit of a test. But it's all part of it, and I've just got to be smart and know what I'm comfortable with out there." He said his minutes were just about right. "I really didn't know what to expect, just probably play it by ear and see how I was feeling. If I was tired, I'd get off and change," the 34-year-old defenseman said. San Jose extended its road win streak to six in a row, and handed Anaheim its third consecutive defeat. Rookie Bobby Bryan put the Ducks ahead with his goal in the first period, with Doug Weight getting an assist in his Anaheim debut. Torrey Mitchell tied it 1-1 with a short-handed goal in the second period. Evgeni Nabokov made 30 saves for San Jose, and Giguere had 36 for Anaheim. Niedermayer, named the playoffs MVP after helping the Ducks win their first Stanley Cup, sat out the first part of this season while contemplating retirement. He informed the team on Dec. 5 that he was returning, and began working out with his teammates. To make room for him under the salary cap, the Ducks traded Andy McDonald and his three-year, $10 million contract to St. Louis on Friday in a deal that included their acquiring Weight. 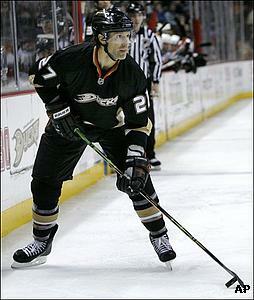 Anaheim activated Niedermayer, who had been suspended while he wasn't with the team, the following day. Niedermayer, a former Norris Trophy winner as the league's top defenseman, didn't look particularly rusty in his first game since June. On one play in the second period when he was hemmed in by two defenders, he deftly flicked a no-look, backhanded pass between them and to an open teammate. Mitchell pulled San Jose into a tie with a determined individual effort on his short-handed goal. Mitchell took the puck away from Anaheim's Mathieu Schneider in the Ducks' zone and took off up the ice with Schneider frantically trying to slow him down. Schneider succeeded in knocking Mitchell to his knees, but the Sharks' center kept control of the puck, regained his feet and skated down on Giguere, beating him with a shot behind the goalie that ticked off his skate and into the net. Weight didn't need long to make his presence felt, setting up Ryan's goal at 13:41 of the opening period. The goal was the second for the 20-year-old Ryan, who was sent down to Portland of the AHL after struggling with the Ducks. Ryan, taken by Anaheim as the second player to go in the 2005 entry draft, was recalled on Saturday. Skating down the right side, Weight slid a cross-ice pass to Ryan, who beat Nabokov with a slap shot from the center of the left circle. "I ran out of steam a little bit," Weight said. "I was excited all night for two nights (after the trade) and I was excited all afternoon. I will get some rest tonight. I'll get my legs under me." The Sharks had a chance to tie it when Milan Michalek was awarded a penalty shot at 19:33 of the first period after he was pulled down from behind on a breakaway. But Giguere got good position to cut off the angle and blocked Michalek's attempt. NOTES: McDonald had a goal and an assist in his St. Louis debut, but the Blues lost 5-3 to Calgary. ... The game was the first of three in a week between the Pacific Division rival Sharks and Ducks. They play in San Jose on Tuesday and Saturday.